These guys are kind enough to put tofu on their menu but they don’t just do it as an afterthought. Their tofu is done extremely well! it’s pressed, marinated, pan-fried, and slightly blackened to near-perfection. 2nd best restaurant tofu in town as far as i’m concerned and it’s not even deep fried! I usually go with japanese pan noodles because i like the fat udon noodles and they use pretty good quality mushrooms, but there are at least 5-6 other things on the menu that are vegan, because hey it’s pretty easy to make a noodle dish vegan. When my wife goes she just gets two orders of tofu plain with no noodles and just eats them like that. Yes the tofu is that good. Also they serve beer and wine. All in All: Great vegan fast food in a pinch. With this as fast food there’s now absolutely no reason for vegans to go to taco bell. Grateful For: Perfectly done tofu instead of how some other restaurants just do tofu as an afterthought. 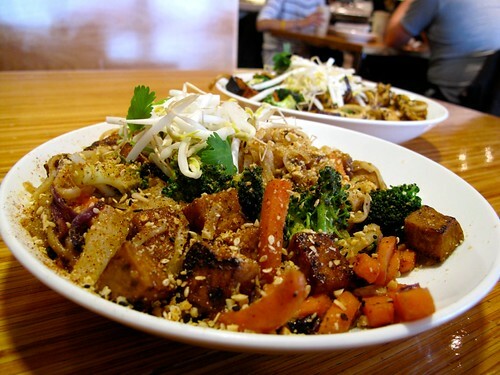 Vegan Wish: They do tofu great, and i wish they’d put the same amount of effort into maybe getting a seitan option. Yum! I love Noodles and Company. Their manager, Tom, is awesome. He helps so much with figuring out what is vegan and what isn’t.. Only problem, if you don’t like spicy food the vegan options are somewhat limited. I love the Japanese pan noodles! Their food is excellent, and their cabatta bread is also vegan. They are awesome with food allergies there also. I have never had a problem at any of their locations.